The E.P.A. recommends getting your septic tank pumped out every 3-5 years. There are a lot of things that determine how often your system will need to be pumped out. You don’t want your sludge layer to be close to 30% of your tank’s capacity. If you have a 1,000 gallon tank, you’d want to keep the sludge below 300 gallons or 1/3 or the tank. 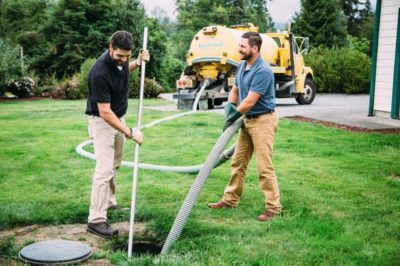 It takes 5+ years for a single adult to warrant a septic system pump out. A family of four could need the same septic pumping in only 2 years. It is best to have your septic system inspected every couple years so you know that it’s good. A septic tank is a large tank where all the sewer waste water goes from your home. Septic tanks are actually quite simple. They are designed to keep the solid waste from your household wastewater. Then it disperses the liquid back into the ground. Sewer pipes move waste out of your home. The sewer pipes then connect into a single pipe leading to the septic system. Inside the septic tank is where everything begins to separate. Solids are heavy and will sink to the bottom. Gray water (or effluent) remains in the middle of the tank. The scum layer forms at the top of the tank as proteins, fats, and oily substances float there. The gray water then travels into the drain or leach field. If you don’t maintain your system, the solids at the bottom of the tank start to build up. When the sludge layer gets too high, these solids will start to exit the pipes that lead to the drain field. This is not good and can easily be prevented with our septic pumping services. The heavy particles that escape get trapped by the gravel of the drain field. This prevents the absorption of liquids ultimately causing the septic system to fail. Spring Septic has been providing our area with Spring Septic Service for over 20 years now. We can get your septic tanks pumped out quickly and the right way. Spring Septic provides septic pump repair services, septic systems installation, septic pumping, and hydro-jet services. If you need a septic service that does it all, call us. We are Spring’s local septic system installers. At Spring Septic we handle more than septic tank pumping spring tx, we handle grease traps too. A grease trap captures oil and grease from wastewater in kitchens before that water makes it to the sewer lines. This works since oil and grease aren’t as thick as water, so they float to the top. A grease trap discovers this oil utilizing a progression of puzzles. The snares, in the long run, need cleaning once the oil development has starts to thicken. There are three primary types of business grease traps utilized in local industries. Here at Spring Septic, our services also include grease trap pumping. We will get the job done without any delay or complication. Whenever you’re in a pinch and having trouble with your grease trap, call us. We can solve your grease trap problems, and get it pumped. Spring Septic is known for our excellent customer service and quality septic services. Click to call us (281) 747-8383 or fill out the form and we will call you! Local commercial locations like restaurants appreciate our grease trap pumping services. There is a chance that if your home is on a septic system you could have a grease trap too. If that’s the case, we can figure it out when we inspect your septic tank and pump it out. Grease traps are similar to Septic Tanks because if they don’t get pumped out, they will back up. A large portion of the grease originates from washing dishes and different things getting poured into the sink. By maintaining and pumping your kitchen’s grease trap, you can get rid of unwanted smells. Also, avoid any fines or disciplinary actions. Clean grease traps equal help keep a clean kitchen. Grease interceptors must be maintained to keep your business running. An unmaintained grease interceptor does not operate correctly. 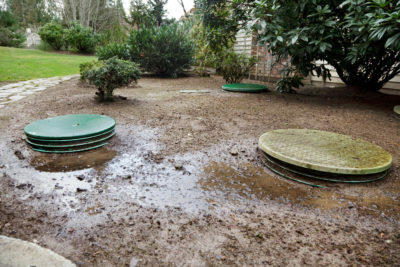 An overflowing grease trap will have you searching for septic companies near me. They don’t prevent oil from entering the clean sewer or septic system. This could cause a serious issue and Oil blockages will shut you down. Cleaning a restaurant after a grease backup will keep you busy for no less than 2 days. Spring Septic has dealt with grease interceptors for years. We can make sure that your grease interceptor doesn’t stop up or fill up. As the grease trap tops off it needs pumping and cleaning. Grease interceptors are intended to hold fats, oil, and grease (FOG). It’s important that you clean your grease interceptor regularly. This avoids fats, oil, and grease from escaping into the sewer water. Most grease interceptors in any food establishment need pumping every 90 days. Here at Spring Septic, we can clean your grease interceptors thoroughly. Since the device needs regular maintenance, we highly recommend that you have a scheduled appointment with us. We’re one call away from getting a more sanitary environment! Fats, oil, and grease (FOG) can harm your establishment and also nature. FOG-clogged lines can back sewage up into your foundation and flood out of sewer vents in parking areas and boulevards. If you see coasting oil or grease stores in a cleanout downstream of your interceptor call us. If you have a clog somewhere in your sewer lines, call us. We’ll bring out the Hydro-Jet and blast the sewer lines clean. The hydro jet can clean about anything in those pipes. 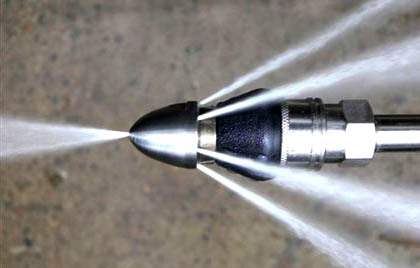 The hydro jetting process uses high-pressure water to remove any contaminants. Spring Septic has a hydro jet that can clean and unclog any size pipes in your home or commercial building. The high-pressure water is extremely effective in cleaning drain blockages. It also does a great job of cleaning the inside of the pipes too. Cleaning Sewer Lines: Clearing all your drains and sewer system can be done quickly, easily, and effectively by using this procedure. It is also used to repair any cast metals, remove any grease, and eliminate the roots in the drain system. Spring Septic can do a hydro jet line cleaning on your home’s drainage system. Don’t worry, our experienced staff will get your drains cleaned. The hydro jet line is more effective than any drainage cleaning process. Hence, we recommend that you try out our hydro jet line cleaning if you need septic service. It can be difficult to recognize it’s time for a new septic system. If you have had to call for help with your septic several times in the last year, you should budget for a replacement. Most likely if you have to your septic worked on, it will need to be pumped. If there is something going on with your system, septic pumping alone will not fix it. No one wants to hear that their septic system is not worth fixing anymore, and it’s time to replace it. There comes a time though that dumping more money into your septic system doesn’t make sense. Spring Septic has the experience to help you make this decision. Over the last 20 years we have seen it all. It is common for well-maintained septic systems to last 20-30 years. If it is time for a septic system replacement though, you are going to want a professional. There is a lot that goes into the design of a septic system that makes them last. Like we said above, a system can last 20+ years… But a poorly designed system can fail in a matter of weeks. Hire a trained professional for your septic installation. They will need to pull a permit. Have a professional design engineered. Also, your septic system is about the most expensive system in your home, second only to your central HVAC system. You don’t want to spend 15,000.00 with a company that doesn’t know what they’re doing. At Spring Septic, our team is licensed and insured. And we are committed to customer service. We can help you through each progression of the septic system installation process. You won’t feel left in the dark. If you notice standing water around your drain field there might be a problem. If you walk out and a strong sewer smell hits you like being kicked in the face by a mule, call us. There are several warning signs that you need septic repairs. You’re toilets don’t have to be backed up to notice a problem with your septic system. The most obvious sign that you need some help is your warning alarm on the septic system itself. There are several things that could warrant septic repair… You can have a pump go out. Maybe the water level is really high and it doesn’t seem to be draining. This could be as simple as a clogged screen. It doesn’t matter what the problem is, when it comes to septic repair, you need to call a professional. There are several things that can go wrong with your septic tank. But, an expert septic repair company like Spring Septic can repair septic tanks easily. Catching a septic problem sooner is better than waiting till later. That means call a professional as soon as you suspect there could be a problem. A fundamental piece of each septic system is your drain field. This is where the gray water travels to be recycled into the ground. Your septic system gets filled with all thewastewater from your home. It is important that it stays operating correctly. The solids sink to the bottom to form the sludge layer. It’s important that this layer is monitored or inspected. Once the layer gets close to 30% of the tank, it is time to get it pumped out. Traditional septic tanks are recommended to be inspected and pumped every 3-5 years. Of course that depends on the many factors. The new aerobic systems should be inspected at least once a year. They are more efficient, but they also have moving parts that need to be monitored. If your home is going on the market, you should go ahead and schedule a septic inspection. It’s best to get it taken care of so if you do have any repairs, you can handle them. 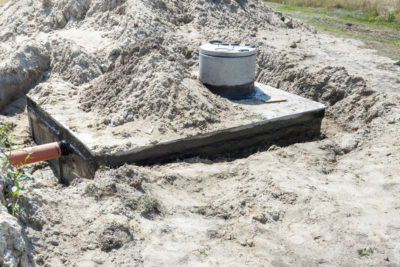 This way everything is handled in advance and the potential homeowner doesn’t think of the septic tank as a liability. 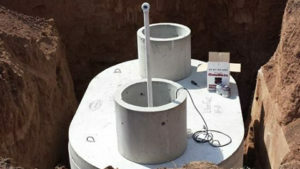 A septic inspection also helps determine how much waste the tank can hold. Also, we can determine approximately how many people it can serve. After we inspect your septic system you will also know how often to schedule septic pumping. Call Spring Septic Service for all your septic needs.